1. In small bowl, stir oregano, salt, paprika, chili powder, garlic powder, sugar, black pepper, cumin and red pepper until well combined. Brush roast with oil and sprinkle with seasoning mixture; let stand 1 hour at room temperature. 2.Prepare outdoor grill for direct grilling over medium-high heat. Place roast on hot grill rack over lit part of grill; cover and cook 12 minutes or until outside is browned, turning occasionally to brown all sides. Move roast over unlit part of grill; cover and cook 25 minutes longer or until internal temperature reaches 135°F. 3.Transfer roast to cutting board; tent with aluminum foil and let stand 10 minutes before slicing. (Internal temperature of roast will rise to 145°F upon standing for medium-rare.) 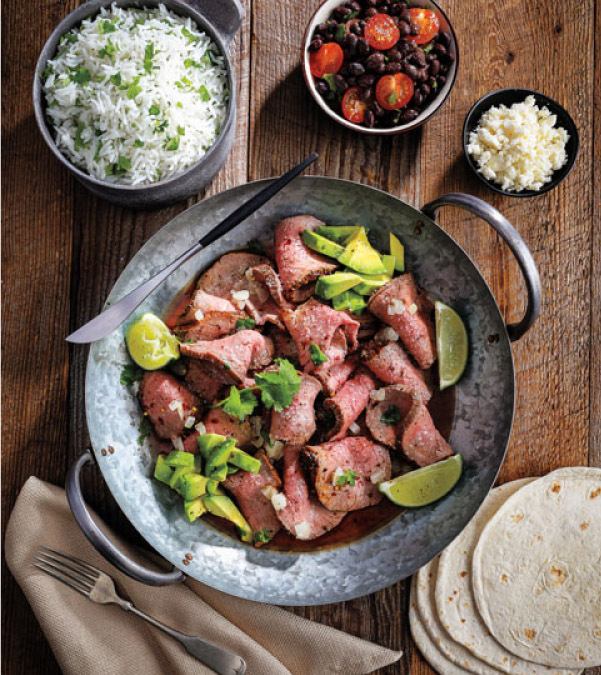 Thinly slice roast across the grain and serve with tortillas and garnishes, if desired. Complete this dish with warm black beans & cherry tomatoes, cooked jasmine rice with chopped cilantro and crumbled queso fresco.